Back in October last year, we installed a new sign in front of the shop with a technique that printed on a sustrate that was then bonded to glass. We heard great things about the technique so thought we’d try it out in Duluth. A couple months into the test, we noticed some discoloration in the white areas of the sign. Some browning was happening, but structurally it looked o.k. 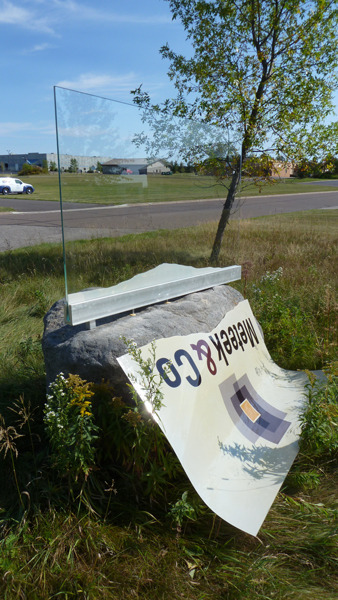 This Spring we noticed some areas starting to delaminate, where the printed substrate was pulling away from the glass. Last week the sign disappeared–clear glass was all you could see. 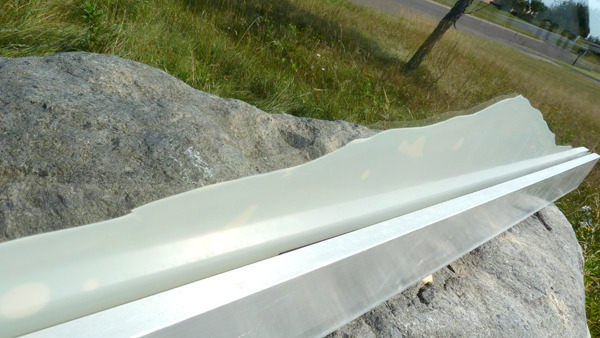 The printed substrate had completely separated from the glass. Gravity wins! We will be looking for more robust methods of printing on glass when we travel next month to Glasstec, the biannual global trade show for all things glass in Düsseldorf, Germany.